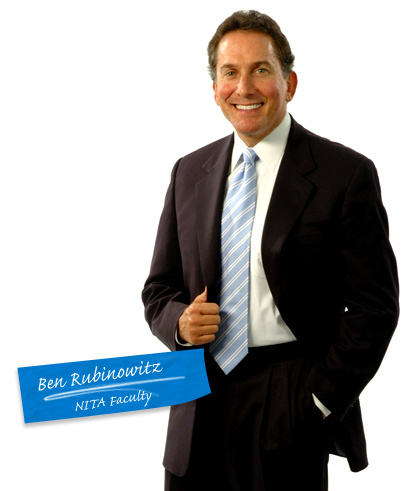 Our managing partner Ben Rubinowitz and the Honorable Nancy Vaidik, Chief Judge of the Indiana Court of Appeals will direct the National Session of the National Institute for Trial Advocacy (NITA) in Boulder Colorado from July 22nd to July 30 2015. ” Together Rubinowitz and Vaidik have invited some of the best trial lawyers, judges, and professors in the country, all of whom are also some of the best teachers of trial advocacy in the country.” Participants will have the opportunity to use NITA’s learning-by-doing method to practice and perfect their skills in the art of persuasion and trial advocacy with an outstanding faculty. Participants will be personally coached on speaking well by Brian Johnson and Marsha Hunter, authors of “The Articulate Advocate” and communication experts extraordinaire. Students will also have the opportunity to practice and master isolated trial skills in a dedicated drill room.